NCAA: def. Northeastern, 87-53 (first round); lost to Auburn, 89-75 (second round). Seniors losing: G Lagerald Vick (14.1 ppg, 4.0 rpg, 45.5 percent from 3). Any NBA Bound? : Vick flirted with the NBA last year and should get some attention during pre-draft workouts. But scouts will have questions about his leave of absence and his commitment to the game. Any One-and-dones or early entries? : Dedric Lawson. The double-double machine has a year of eligibility left, but he’s No. 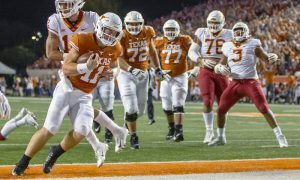 43 on ESPN.com’s Top 100 for the 2019 Draft. So it’s possible he could leave early. Devon Dotson and Quentin Grimes are ranked Nos. 66 and 71 in ESPN.com’s Top 100, but their departures for the NBA seem less likely. Don’t be surprised if, despite the injuries, if C Udoka Azubuike tests the waters. 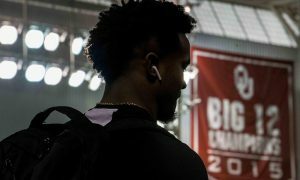 He’s not ranked in the ESPN.com Top 100, but you can’t coach his size and he may not want to risk another year in college and another potential injury. Same goes for F Silvio De Sousa, who is suspended for the 2019-20 season. The NBA is unlikely, but he could bolt for Europe. 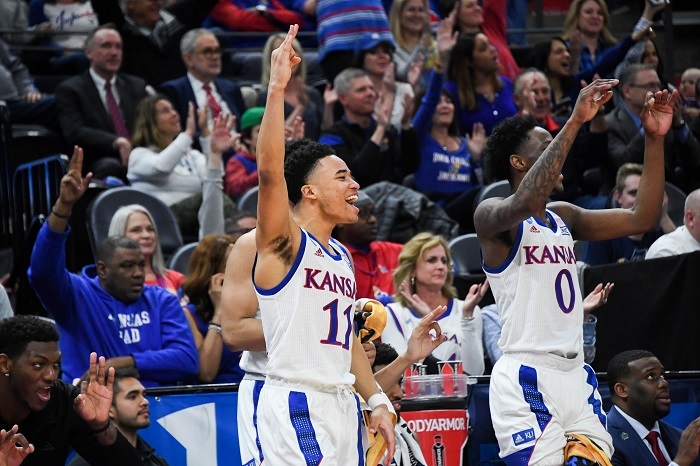 Top players returning: F Dedric Lawson (19.4 ppg, 10.3 rpg), G Marcus Garrett (7.3 ppg, 2.5 rpg), G Quentin Grimes (8.4 ppg, 2.5 rpg, 34.0 percent from 3), G Devon Dotson (12.3 ppg, 3.7 rpg, 3.5 apg), G Ochai Agbaji (8.5 ppg, 4.6 rpg), F David McCormack (3.9 ppg, 3.1 rpg), C Udoka Azubuike (13.4 ppg, 6.8 rpg, played in just 9 games). 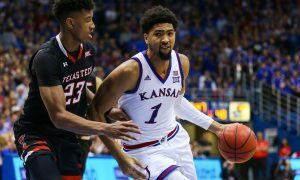 The players you don’t know about: The Jayhawks played just about everyone of note, including burning redshirts for players they hoped not to. So Kansas really doesn’t have a player that fits this category. Recruits already in the house: G Issac McBride, 6-foot-1, Little Rock, Ark. (Arkansas Baptist School System); SF Christian Braun, 6-foot-5, Overland Park, Kan. (Blue Valley Northwest). Both are signed and both are among the Top 5 recruits in their state. But both players are outside the national Top 100, per 247Sports.com. The Jayhawks likely aren’t done recruiting. As Gary Bedore at the Kansas City Star notes, the Jayhawks are in the running for the No. 7 player in the 2019 class, 6-foot-9 forward Matthew Hurt from Marshall High in Rochester, Minn.
Commitments yet to sign: 247Sports.com has no hard commits listed for Kansas. Summarizing the season: At the start of the season Kansas looked like its normal self. 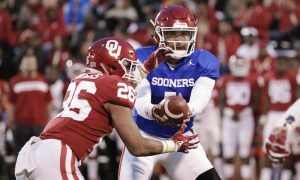 Once it got into Big 12 play, however, things changed. 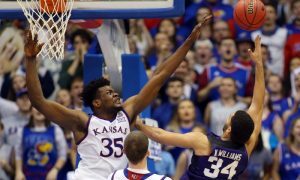 Losing Azubuike to injury hurt the Jayhawks’ inside game. Losing De Sousa to suspension hurt their overall depth. Vick’s leave of absence came at a horrible time. And so the Jayhawks became something less than we expected. Lawson had a huge season and assumed Azubuike’s load inside. Head coach Bill Self turned to a four-freshman starting lineup out of necessity and the growth of players like Dotson and Agbaji continued. At various times different players shouldered the secondary load for the Jayhawks. 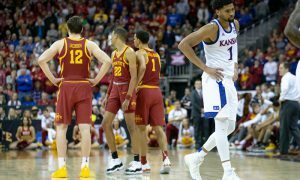 But the Jayhawks were unable to win the Big 12 regular-season title for the 15th year in a row, and lost to Iowa State in the Big 12 Tournament championship game. Against Auburn in the NCAA Tournament the Jayhawks ran into a buzzsaw that shot 64 percent from the floor. This Kansas team will be remember for its inconsistency and, on some level, what could have been, especially if Azibuike had been healthy. Looking ahead to 2019-20: First Self must wait to see what his current players do, specifically Lawson and Azubuike. 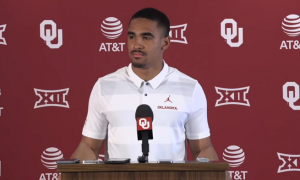 If both choose to come back the Jayhawks are ready to make another run, as Lawson may be the most polished forward in the Big 12 and Azubuike’s return would take the heat off Lawson. 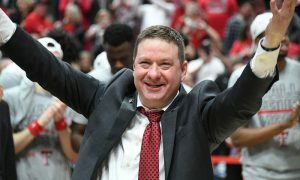 If neither comes back, then Self has to scramble to find some size to go along with McCormack, either on the recruiting trail or on the transfer market. I don’t expect the two guards in the ESPN Top 100, Dotson or Grimes, to leave. They’re borderline second-round picks, at best, and they would benefit greatly from another year in Lawrence. If that holds, then the Jayhawks have some tremendous perimeter players to build around. If Lawson and Azubuike choose to leave, these Jayhawks will be a young, perimeter driven team looking for some veteran leadership inside. Either way, the team’s overall 3-point shooting just get better. As one might expect, they’ll be a Big 12 contender. But the improvement of these young players and Lawson’s decision will determine how much of a national title contender they can be.